This week’s minorities in cartoons entry is “Tutenstein,” a cartoon that ran on the Discovery Kids cable channel (now Discovery Family, by way of The Hub) from 2003 to 2008. The series’ premise is centered around its eponymous star. His real name is “Tutankhensetamun,” a play on the name of real-life Egyptian pharaoh Tutankhamen (the famous “King Tut”). Dying as a 10-year-old, Tut’s sarcophagus ended up in a New York City museum 3,000 years later. There, Tut was somehow brought back to life as a living mummy (no relation to the Marvel character), and encounters Cleo Carter, a teenaged African-American girl who works as a volunteer at said museum. Cleo’s strongly interested in Egyptology, and hopes to become an egyptologist like her (late) father. Her name’s a reference to Cleopatra and Howard Carter (the man who discovered the real-life Tut’s tomb). Rounding out the main cast is Luxor, Cleo’s pet cat who (via magic) gains the ability to talk and becomes Tut’s servant. 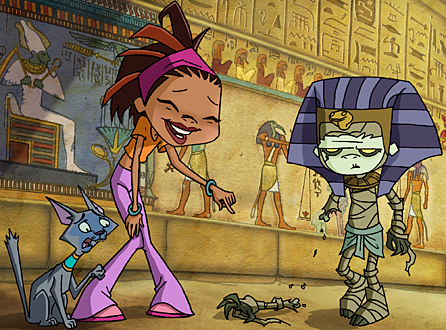 Most of the episodes revolve around either Tut’s poor attempts at adjusting to 21st century life (while hiding his identity/existence from others they run across, including the curators of the museum), learning the value of his friends, or dealing with the Egyptian gods, who hold some level of antipathy toward Tut. Tut’s also still used to being treated like royalty. Thus, he sometimes behaves in a spoiled fashion. Also coming up frequently is Tut’s use or misuse of magic, as he possesses the “Scepter of Was,” a magic wand. “Tutenstein” aired in reruns through the remainder of Discovery Kids’ existence, and into the early days of The Hub. Only a handful of episodes have been released to several DVDs. Several voice artists, including Jeannie Elias, Maryke Hendrikse, and Donna Cherry, voiced Tut. Crystal Scales, the voice of Libby on “Jimmy Neutron,” voiced Cleo. David Lodge voiced Luxor. Lodge is a voice artist who’s mostly worked on video games, English-language dubbing of Japanese anime, and several Power Rangers series.